Never throw fluorescent bulbs in the trash because they contain mercury. 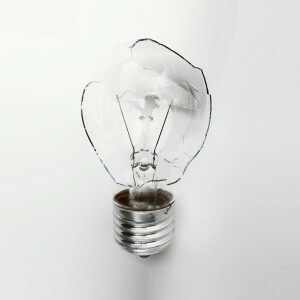 Before cleaning up this type of broken bulb, air out the room for 15 minutes. Next scoop pieces into a container and store it outside until you can dispose of it as Household Hazardous Waste. Broken LED bulbs can go in the trash. Dispose of them like other broken glass, in a sealed container. If you don’t have one, wrap the pieces up securely in newspaper, tape it shut and label it. Labeling broken glass helps protect sanitation workers from injury. Broken halogen bulbs can be thrown in the trash, but air out the room for 15 minutes before cleaning up. Dispose of them like other broken glass, in a sealed and labeled container, or taped up with newspaper.